John Fyfe leads a palmistry workshop. Shakti Healing Circle, 3/F Waga Commercial Centre, 99 Wellington St, Central, HK$1,250 (US$160). Jenny Atkinson leads an astrology workshop. New Age Shop, 7 Old Bailey St, SoHo, HK$350 (US$45). In the SCMP’s letters page, there was an interesting premise: “Hospital staff need to learn common sense”. This is rather like closing the stable door once the horse has bolted … only the door is probably so ridden with huge gaping holes that it is little wonder the horse escaped in the first place!! The premise is wishing thinking. Once people reach adulthood, their brains’ wiring is pretty much fixed on certain pathways of cognition and “reasoning”. It is extremely difficult to unlearn this and to learn some “common sense” if it has not already been instilled. This is why it is extremely difficult to teach old dogs new tricks. Besides, what is “common sense” to one person may not be so “obvious” to another. Teaching people at a young age (i.e. at school) critical thinking skills is the best solution. The next best solution is for employers (in this case, the Hospital Authority and/or the HKSAR Government) to test job applicants and assess all current employees on their reasoning skills. This will at least help to filter out those who are just plain stupid or lazy to think and act appropriately in real time. Unfortunately, this will never happen. I was puzzled by the comments of the Hospital Authority chief on another blunder by Caritas Medical Centre staff regarding the treatment of a seven-year-old boy with an eye injury ("Hospitals chief defends Caritas staff member", September 21). Shane Solomon said that "what the clerk was doing was to implement the policy". One would have expected that further to the blunder in December of last year (when a man collapsed with a heart attack outside Caritas Medical Centre and later died), instead of reviewing policies and procedures and probably implementing new ones, the authority would have tried to promote the concept of common sense with its staff. What kind of place are we living in when it is fine to simply "implement the policy" for HK$700 without caring for a seven-year-old boy? Any patient has the right to expect Hospital Authority staff, of whatever the rank, from receptionist to neurosurgeon, to be equipped with some common sense and a conviction that they are paid by the public to help and care for the public. At the very least, if they feel that they are not in a position to bend the rules for a good cause, they should call a supervisor who hopefully will be able to make a correct decision. Back in August, the Darkside blog mentioned the fierce opposition by the local (i.e. implied-to-be-Chinese) community to the opening of the Blue Goose pub in Mid-Levels. Apparently over 2,000 signatures were collected, as the fear of drunk Gweilos wandering the streets seemingly and effortlessly appeared in their media-driven stereotypical thoughts. Pub equals Gweilos equals drunk Gweilos equals community meltdown. It should be noted that drunk Gweipos are included in the stereotype of drunk foreigners. So before it could take flight or even wet its webbed feet, the Blue Goose was a Sitting Duck just waiting to be made extinct. It was simply a duck out of water. Just like the Dodo, just waiting to be shot. However, the Cooked Goose will soon emerge (a Phoenix?) from the not-quite-fiery-ashes-but-sodden-scaffolding as a new Pacific Coffee outlet. Will it become a Lame Duck or Golden Goose? Only time will tell. Dare I ask fellow bloggers to come up with more 'fowl' bird puns?? What would happen if over 2,000 signatures were collected from Gweilos to oppose the opening of a coffee shop? Perhaps a good reason against the opening of a coffee shop is, say, for fear of too many crazy, hyper and caffeine-buzzed locals wandering the streets and becoming public nuisances? Now wouldn’t that be something!? Roger Federer’s hotdog ‘tween the legs was nothing special. It appeared to be an amazing shot only because it was a winner that set up match point in the semi-final of the 2009 US Open. However, the real reason why it appears amazing is due to the laziness or casualness of his opponent, Novak Djokovic rather than to Federer’s lucky exhibition-style trick shot which, for the record, should in no way define his tennis brilliance. I am a fan of Federer’s skill, grace and athleticism on the tennis court. Anyone who knows anything about tennis understands where Djokovic’s prime position should have been. Djokovic was in an advantageous attacking position that had his opponent under pressure and scurrying back to the baseline. He should have been right up by the net waiting to clean up the point with a volley. Instead, Djokovic was casually waiting near the “T” zone, which is basically “no man’s land”. Even the British tennis public, generally not known for their following of tennis around the world, can use their specific knowledge of Wimbledon to confirm that Djokovic should have been standing by the net ready to intercept the ball. "I do practice them a lot actually but they never work. That's why I guess it was the greatest shot I ever hit in my life." Therefore, it was Federer’s greatest ever luckiest shot, but not his greatest ever shot. Roger Federer’s place in tennis history does not deserve to be cheapened by a lucky shot. Note: Apologies for my slow turnaround times. I know the US Open finished over a week ago. Ink Poisoning Scam: Fish n' Chips Anyone? Today's Hong Kong media scare is a silly story about "ink poisoning". 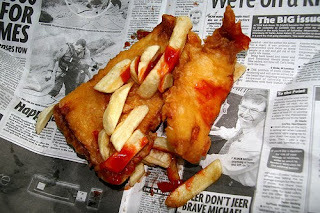 For years the British have scoffed down fish n' chips from newspapers soaked in vinegar and tomato sauce! Think about the ink seepage from that? Any side effects or poisonings? The obvious answer is "no". No side effects. However, there are direct effects from eating too many fried food items such as chips and deep-fried mars bars ... but that's another story! Diners who spread their french fries across paper tray mats in fast-food restaurants to get maximum ketchup coverage may be risking ink poisoning. The warning comes from the unlikely source of the Democratic Alliance for the Betterment and Progress of Hong Kong, which says the greasy practice is hazardous because ink from the paper may seep into the fries. But experts at the Centre for Food Safety say the party's claim is without foundation. A random DAB inspection of McDonald's and KFC outlets in the mainland found written warnings advising customers not to put food directly on top of paper mats. 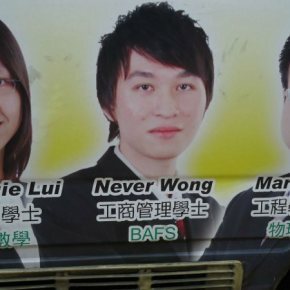 Hong Kong has no such warnings, said Danny Chan Chung-cheung of the DAB. As a result, mainlanders have developed the habit of putting a paper napkin down before placing their food on the trays. The center said there is no scientific evidence to prove that ink on food may damage your health. But Chan urged the center to follow up on the matter and also promote higher hygiene standards in the city's fast food chains by, for example, placing wash basins near restaurant cashiers and in customer areas to encourage handwashing. A spokeswoman for the center said customers should not place food directly on tray mats because they are not designed for that purpose. But she added studies show that when printing ink is ingested it does not pose significant health risks. A McDonald's spokeswoman said: "All packaging that is in contact with our food, including the tray mat, are governed by strict quality control measures. "We also ensure the paint being used [on tray mats] meets international food safety requirements." A KFC spokeswoman said all its packaging materials, including paper used in food baskets, are up to food safety standards. "We are now [considering putting] precautionary wordings on all tray mats," the spokeswoman said. Dr Yeung Chi-hung, senior lecturer at Hong Kong Polytechnic University's department of applied biology and chemical technology, said customers need not worry too much about the health risks of ink. Yeung said it used to be a general practice in Hong Kong for people to wrap food such as raw meat in newspapers, and he is not aware of any harmful side effects. Whether ink from tray mats may be absorbed by the food depends on the length of exposure and the area of contact, he said. Chinese ham with mixed nuts mooncake. So that means: soft, rubbery, salty, savoury ham, with hard, crunchy, stick-in-your-teeth mixed nuts, enveloped with sweet, sticky, powdery stick-to-the-roof-of-your-mouth lotus seed paste. A classic Chinese recipe or a new-fangled Far East concoction? Has anyone else spotted any "interesting" mookcake flavour combinations? 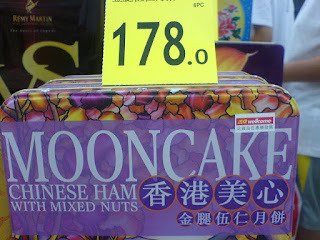 The cost and packaging of mooncakes is also very interesting. Retailers always try to sell mooncakes with the lucky number 8 in the price, but bizarrely also always sell mooncakes in unlucky boxes of 4. Why is this? With the above-mentioned ham-nuts mooncake item, a box of 4 mooncakes sell for a seemingly lucky $178, which works out to be an apparently unlucky $44.50 per mooncake. Good old Tung Chee-hwa, former HKSAR chief executive, gives further proof that ‘old dogs don’t learn anything new’. He is still as patriotic, paranoid, and puppet-like as ever, seemingly knowing that ‘Beijing Big Brother’ is watching his every move. "I'm very confident that when the new China celebrates its 100th year - in 40 years' time - she will definitely have become a modern, stable, democratic, civilised, harmonious country." It took two weeks for me to become a proud owner of the iPhone 3GS (happy to get it on Sunday). I know, I know. Others, like Spike, have had the iPhone for what seems like 'forever', especially given how often other people in Hong Kong seem to change phones every other quarter or so. Hong Kong has a mobile phone penetration of 163%, which statistically-speaking indicates that every person in Hong Kong owns 1.63 mobile phones. Personally, 5 mobile phones is the most I've seen someone have. It was a taxi driver whose windscreen was peppered with mobile phones, obviously ready to take certain calls, for certain discount taxi groups, in certain areas. Alternatively, perhaps he had multiple mistresses? Talk about multi-tasking! Anyways, in contrast to the relatively long wait I had for my iPhone, when I went to pick it up 3HK's shop staff were efficient (or shall I say experienced) at getting people in and out quickly. Continuing with the Star Wars theme, there is a free App that I intend to use as an emergency flashlight, but which doubles up as, ahem, a lightsaber. It's called ... Lightsaber. In a day where the media circus covered four court cases involving University of Hong Kong (HKU) staff or students, to their credit the Communications and Public Affairs Office (CPAO) at HKU did not come up with some crazy conspiracy theory unlike a certain crazy Croatian football president. 1) Ex-Dean of Medicine, Professor Lam Shiu-kum, 65, was charged with misconduct in public office and sentenced to 25 months in prison. 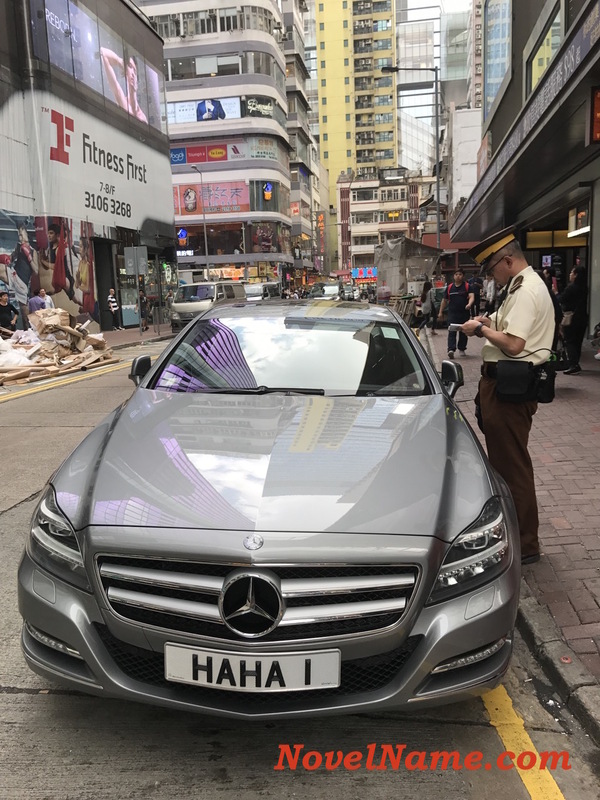 He was jailed for receiving HK$3.8 million in donations to his own company while knowingly using the HKU letterhead and association as a guise for donations seemingly to the university. 3) A HKU undergraduate student was charged with theft, and fined HK$3,500 (US$450) for stealing knick-knacks worth up to HK$1,000 (US$130) from five shops in Sheung Shui. 4) Two HKU undergraduate students were charged with credit card theft. Both were released on HK$500 (US$64) bail and are scheduled to return to court on September 17 for sentencing. Yes it was a coincidence that four court cases involving members of HKU converged on the same date. "The incidents actually happened at different times. It is just coincidence that we had three cases today. We are not disappointed as it is just a coincidence," said a HKU spokeswoman. However, what are the chances there will be conspiracy theorists and Chinese fortune tellers who, in their eagerness to find confirmation bias, will dig up other negative incidents that involve HKU? Did any fortune tellers predict that HKU would be caught up in plenty of bad luck this year? Also, note how many C’s are used in this blog entry … must be some cynical conspiracy in that too! It’s been over a week since I registered for the new iPhone 3GS in Hong Kong. Does anyone have any experience of how long it took to register for and then receive their iPhone? 3Notice: Thank you for your registration. We will notify you your handset collection date and location in phrases. Customers should register only ONCE. Orders will be put on a waiting list and processed according to the last registration date for multi-registrations. I’m certain there will be one or two fun iPhone apps about Star Wars! Aouda Au, Instructor, Department of English and Communication, City University of Hong Kong, Hong Kong. Hong Kong businessman Carson Yeung’s planned but prolonged takeover of club Birmingham City FC has further fueled Hong Kong’s already huge interest and following in the English Premier League and in the England national football team. Therefore, I couldn’t help notice a news story about the president of the Croatian Football Federation Vlatko Markovic fabricating a fantastic theory that Birmingham City were deliberately taking out Croatian national team players. Two Croatian players (Luka Modric of Tottenham Hotspurs and Eduardo da Silva of Arsenal) have recently been injured while playing for their club teams, and those matches coincidently involved Birmingham City. Injuries are “part and parcel” of the game, but Markovic is crying foul and appears to be up to mischief. Either that, or he's just plain silly to claim: "I can only ask whether someone did it deliberately on the eve of the game with England. I can only ask myself whether it is a coincidence or not." England play Croatia in a key World Cup qualifying match on Wednesday 09/09/09. Despite the cheekiness of all this, the Birmingham chairman David Gold was unperturbed and instead of reciprocating like-with-like with an appeal to emotion and to ignorance, simply said: “To say such things is little short of incredible. For a man of such stature and position in the game to come out with such rubbish is pathetic. His remarks border on paranoia and I struggle not to take it personally when they two incidents he talks about involve my club. To lay such stuff at Birmingham's door is appalling. It's emotive and doesn't stand up to close scrutiny." Gold was also culturally sensitive too: "We should make light of it - maybe the problem is the statement has been completely lost in translation, maybe he meant to say something different." Such cogent rational comments are rare these days and stand out like a beacon relative to the usual soundbites and quotes that come through the media. Kari Schroeder gives a free talk on matrix energetics. 7pm-9pm, Balance Health, 27/F, 3-5 Arbuthnot Rd, Central.